ASIA/VIETNAM - Msgr. Paul Bui Van Doc was a Pastor who "brought the joy of the Gospel to all"
Vatican City (Agenzia Fides) - "The sudden and tragic death of Msgr. Paul Bui Van Doc, Archbishop of Hochiminh Ville (formerly Saigon), during the course of the ad limina visit trip in Rome, has deeply struck us. The providence of God wanted to call the Archbishop to himself, in this moment. Despite the pain of losing a dear brother Bishop, we now feel that there is God's presence in this event: we are questioning ourselves to understand what God wants to tell us with this event": this is what Msgr. 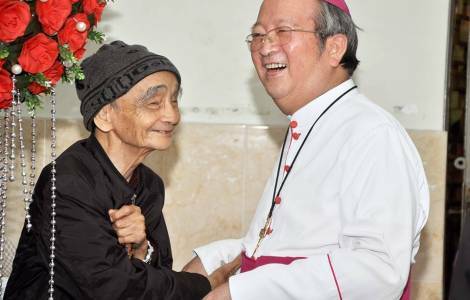 Joseph Dinh Duc Dao told Agenzia Fides, at the head of the diocese of Xuan Loc, on behalf of the Vietnamese Bishops, in the Vatican for the ad limina apostolorum visit, after the death of the Archbishop of Hochiminh-ville, Msgr. Paul Bui Van Doc, yesterday, March 6, in Rome. Remembering the late Archbishop, Msgr. Dinh Duc Dao reports: "We were students together at the Urbano College of Propaganda Fide. He was a man, a priest whose heart was always filled with the joy of the Lord. His episcopal motto, 'Ad Deum laetitae mae', the emphasis was put on the joy that every baptized person finds in Christ. This was his will and his mission: to bring everyone the joy of the Gospel and to lead the people of God entrusted to him to live the joy of the Lord. Today he is in Paradise to enjoy this joy". In the Archdiocese of Hochiminh Ville, recalls Msgr. Dinh Duc Dao, "his pastoral work was aimed at building and living the communion and unity among all the different components of the local Church. Besides many immigrants and the poor live in that territory, and the apostolate that he promoted and organized gave great attention to immigrants, according to a spirit of reception, solidarity, service".